Financial planning is not a glamorous job in Singapore. Regardless of one’s education and experience in the industry, it is inevitable that some consumers I come across do view practitioners in a negative light. 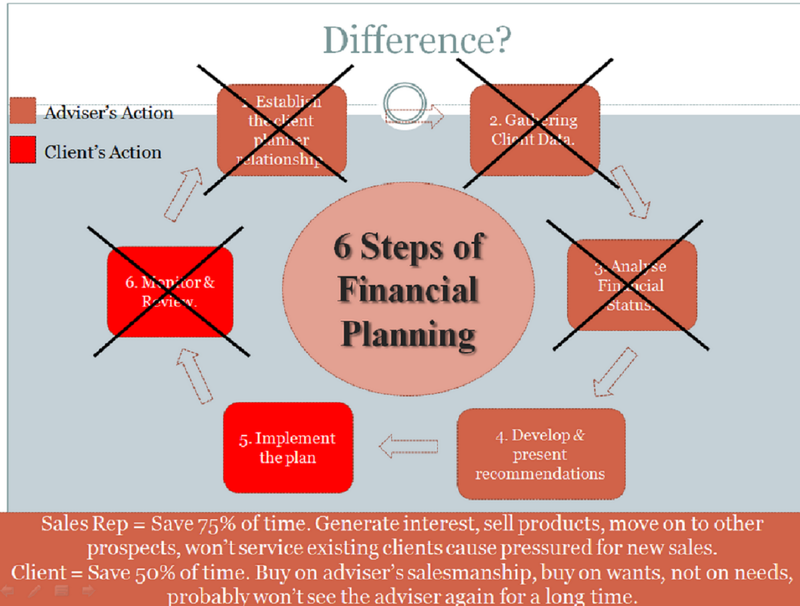 I believe this is strongly attributed to its intense focus on financial sales rather than financial planning. As a result, many young people have joined the industry hoping to be a professional often become disillusioned that remuneration and recognition is pegged to how good one is in marketing products rather than helping their clients. The turnover is so high in the industry that an estimated 90% will not stay over 3 years. Usually, only 2 kinds of financial advisers can survive in this competitive environment for the long haul. 1. Financial Salespeople who have mastered the art of conning unsuspecting consumers. 2. Advisers who find real meaning in their line and are convinced they are helping people solve problems while earning a living in the process. For obvious reasons, one should shun financial salespeople. However finding an adviser who has your interests at heart is not as easy as it seems as no one will claim to be poorer than their competition. From my experience, the best way to differentiate the 2 types of advisers is via the approach undertaken. - Explaining benefits and encouraging a prospect to buy without identification of client’s real needs. - Unwilling (often also unable) to advise the client based on the whole context of his finances. - Conducts Ad-Hoc planning in the pretense of giving advice. - Examples: Insurance Road shows, buying products from banks, supporting friends who are part time agents. - At least 1-2 hours spent on gathering client data. - Analysing a clients financial status with a clients financial needs in mind. - Focus is on solving client’s problems, not closing a deal. - Willing and able to advise client based on the whole context of his finances. 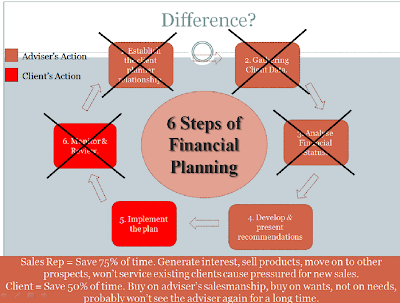 - Conducts comprehensive financial planning because it is the right thing to do. - Examples: Fee based financial planning or simple financial planning conducted in a conducive environment like office or residence. Financial advisory can be a very honorable profession if it is being conducted in the right spirit. There are enough bad apples in the industry, let’s do the right thing for our clients. Hi Gary, I think regardless how savvy we are, we need to put on a sales cap and need to have a long term marketing strategy in our profession. The successful ones are not necessarily conning the people and be product focused. There is a demand for consumers to seek assistance. Not everyone are interested to DIY or to understand the products.